Like so many great American success stories DONJOY, the recognized leader in bracing and supports, and the largest orthopedic rehabilitation company in the world, began in a garage. Elbow injuries happen, especially if you’re an athlete. But, it doesn’t have to bench you from the game. 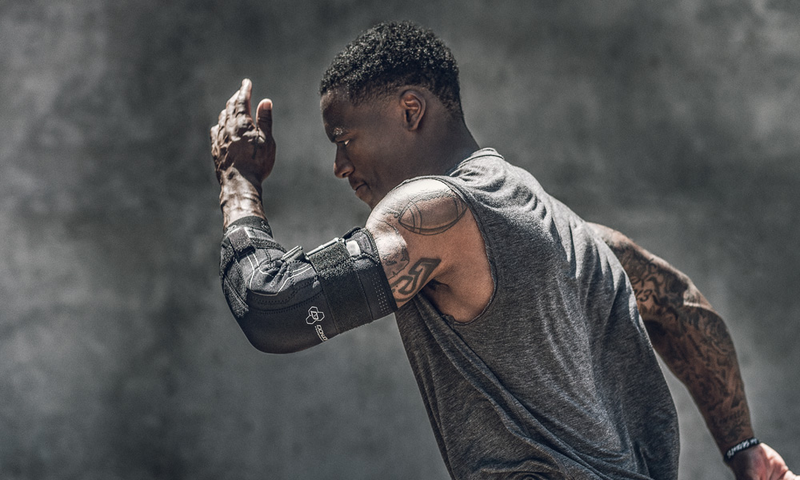 The DonJoy Performance® Bionic™ Elbow Brace II, updated from the original Bionic™ Elbow Brace, can help protect the medial/lateral ligament as well as help limit range of motion so you can manage elbow pain and prevent re-injury, whether on or off the field. Delivering improved features and benefits from the original Elbow Brace, here are three things you didn’t know about the Elbow Brace II. Made with function in mind, the Bionic™ Elbow Brace II is a sleeve design with an elbow crease cutout that provides a functional and athletic fit. In addition, it helps with breathability and comfort while aiding in ligament support. Designed with removable Bilateral Polycentric Hinges, the Elbow Brace II helps provide medial/lateral ligament support and range of motion protection to aid in ligament strains, hyperextension, elbow instability. Sometimes elbow sleeves cause excessive sweat and irritation. The Elbow Brace II perforated neoprene helps regulate body temperature and helps prevent skin irritation. Machine washable and easy to put on, this elbow brace can help you manage elbow discomfort while aiding in compression and comfort. Fitting the left or right elbow, the Bionic™ Elbow Brace II can be worn during activity like football, basketball, softball, baseball, soccer, cheer, or track & field to help keep you off the sideline and on the field. The contents of this blog were independently prepared, and are for informational purposes only. The opinions expressed herein are those of the author and are not necessarily indicative of the views of any other party. Individual results may vary depending on a variety of patient-specific attributes and related factors. Why Do You Need to Strengthen Your Hip Flexors? How Do You Train During the Offseason?